The "Lastenroller" type of vehicle was enormously popular in southern Europe and Italy. 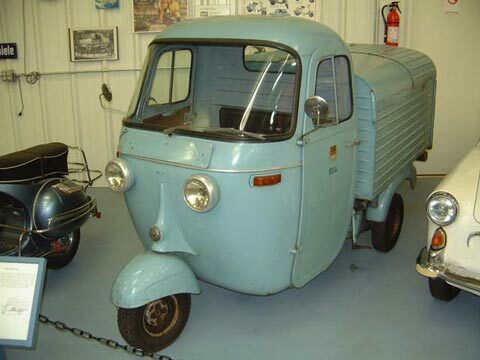 The Ape (bee) Model "A" (1948  1954) was an open scoter, in three body styles, and was the Model "B" (1955  1956) in four body styles. The Model "C" (1956  1963) introduced the "cabin" or "half cabin" in no less than eight different body styles. This is a full-cabin, full-box tipper with the double headlamps only seen on German export models. Weight: 395 kg Electrics: 6 v 3 Wheels: 4.40 x 8"